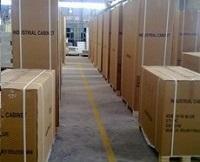 Flammable Liquid Storage Cabinets are designed for the safety storage of flammable liquid containers. These highly visible and durable yellow powder-coated cabinets features a red "Flammable - Keep Fire Away" warning on the front doors. Safety equipment to store, transfer, use, and dispose of hazardous materials. Distinct safety signs and directions. Highly visible warning label" Flammable-Keep Fire Away". All welded construction versus spot welded construction. Retains high gloss look and minimizes the effect of corrosion and humidity. Dual vents with built-in flash arresters strategically placed at bottom and opposite top. 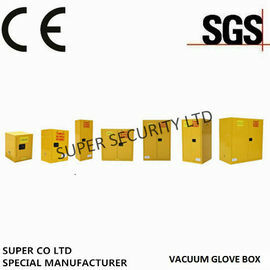 50mm (2'') leak-proof sump to contain spills. Zinc steel shelves are adjustable on 55mm(2.2'') space for versatile storage. Welded shelf hangers interlock with shelf to offer maximum "no slip" stability and no flimsy bracket to lose. Earthing point to guard against static electricity dischange. Exclusive paddle lock for extra security. Two keys lockable. Minimal air-gaps provide better protection. 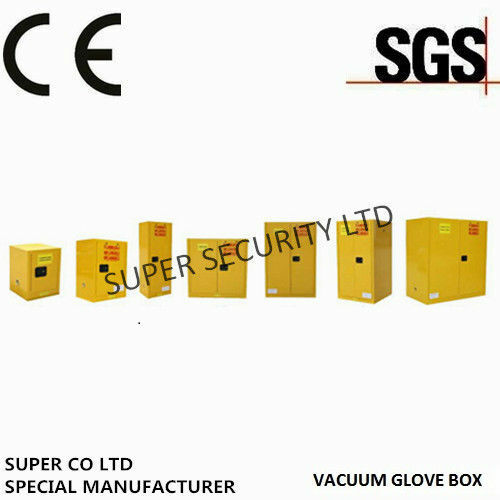 SUPER CO LTD offers a full line of Flammable storage cabinets, Paint &Ink Storage cabinets, Corrosive storage cabinets, storage cabinets,cleanroom-safe polypropylene cabinets for today's most demanding manufacturing and laboratory environments. 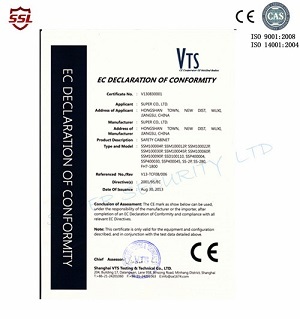 Each product stands up to the most stringent cleanroom / safety requirements. Now you can have years of clean, safe storage of your hazardous acid / corrosive chemicals and materials with out the rusting due to metal construction or the delaminating of wood core products. 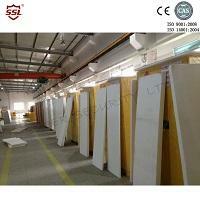 containment base area to provide a 100% liquid-tight safe environment. Custom designs and sizes are available. Flammable & liquid storage cabinets, 2 gallons to 90 Gallon capacity, are available based on the ultimate size of the cabinet selected. All interior and exterior surfaces, including shelves, are finished with industry standard yellow powder coating. Special corrosion resistant powder coated finish on all interior and exterior surfaces, including shelves, offers the end users an excellent protective storage vechile for acids and and other corrosives. Powder coating gives superior protection against chemical attack in event of a spill or splash. For additional protection, each cabinet is supplied with high density polypropelene trays for the shelves and bottom of cabinet. Not recommended for use with Sulfuric, Nitric or Hydrochloric Acid. See the Poly Acid-Corrosive Cabinets that are suitable for use with these acids. 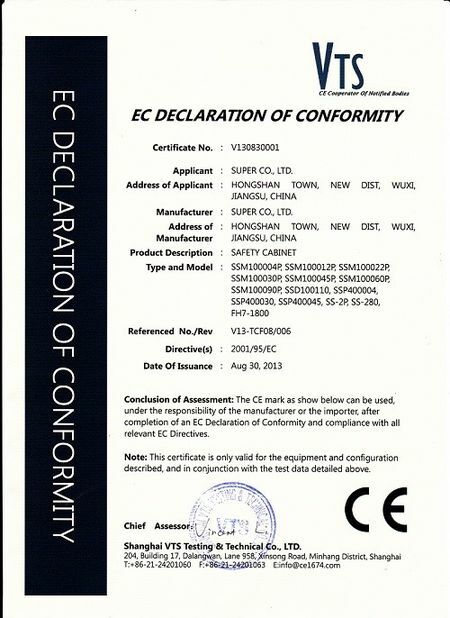 Factory Address:Hongshan Economic Development Zone, Wuxi city, Jiangsu province. Sales office:Hongshan Economic Development Zone, Wuxi city, Jiangsu province. 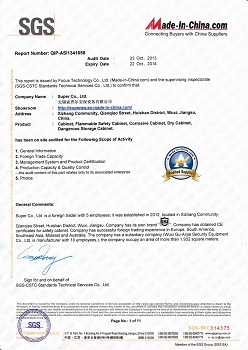 China Good Quality Chemical Storage Cabinet Supplier. 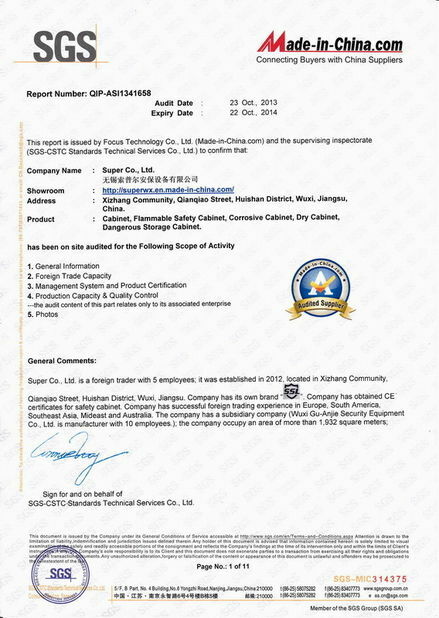 Copyright © 2012 - 2019 chemical-storagecabinet.com. All Rights Reserved.